New York State lawmakers agreed to a ban on single-use plastic bags Sunday, making the Empire State the second in the nation to do so. The decision was part of a $175.5 billion budget agreement that included other progressive measures including the elimination of cash bail for most misdemeanors and non-violent crimes, three-hours-off on election day for voting and the nation’s first-ever congestion pricing program in the busiest part of Manhattan. The budget was expected to be passed in a series of bills during a session Sunday that could carry into Monday, the Associated Press reported. “I am proud to announce that together, we got it done,” New York Governor Andrew Cuomo said of the budget, according to the Associated Press. Plastic bags have blighted our environment and clogged our waterways. The plastic bag ban will go into effect March 1, 2020. Counties and cities will have the option to charge customers five cents for paper bags. Two cents would then go to a fund to help low-income customers buy reusable bags and three cents would go to the state’s Environmental Protection Fund. In passing the ban, New York follows California, which was the first state in the nation to ban plastic bags in 2016. In Hawaii, they are also effectively banned since every county in the state prohibits them. “I think we’ll look back in a few years and people will wonder why we didn’t do this sooner,” Democratic Nassau County State Senator Todd Kaminsky, who sponsored the bill and chairs the environmental conservation committee, told The New York Times. 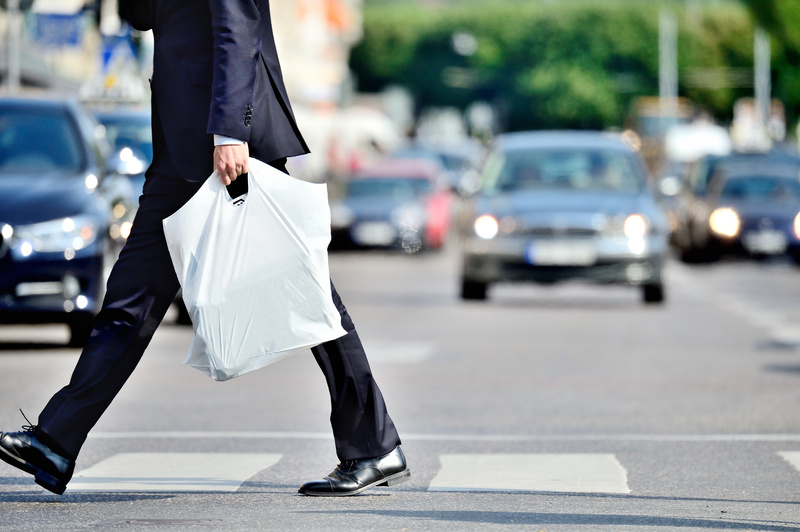 The ban comes after several failed attempts to manage plastic bags in New York. In 2017, Cuomo signed a bill that blocked a New York City plan to charge five cents for plastic bags. Last year, a similar, state-wide ban was blocked by Republicans in the state Senate. But Democrats picked up eight Senate seats during the 2018 midterm elections, gaining a majority and making the ban possible. “I’m looking forward to it. I’ve been waiting for it for a long time. I’m tired of having to recycle them,” Midtown resident Louise Sharakan told CBS2 of the upcoming ban. “I hate it. I use them all the time, believe it or not, in my apartment. I don’t have a space for garbage. I hang them by the door and I use them for garbage,” said Midtown resident Glen Wiehl. “So what are you going to do?” CBS2’s Marcia Kramer asked. “I’m stocking up now,” he said. The most controversial part of the ban has proved to be the optional paper bag fee. Some environmentalists think it should not be optional, since it could result in shoppers simply using paper bags instead of purchasing reusable bags. “New York had a chance to show real leadership and came up short,” Environmental Advocates of New York Executive Director Peter Iwanowicz told The New York Times. Business groups, who were critical of the ban in general, thought some of the fee should have been directed back to the stores to help with implementation costs. The ban includes exceptions for takeout, dry cleaning, bulk and deli items, newspapers and bags like garbage bags bought in bulk.
? The Girl Born Without Arms And Knees Rules The World With Her Story Of Self-Acceptance 70-Year-Old Grandma Who Walked 10 Miles to Help Cyclone Victims Is Rewarded By Billionaire ?